A number of things get better with age. Port, Whisky and Balsamic Vinegar, for instance, are best when they have matured several years. Cheese may need less time, but the 3-year old Parmigiano Reggiano that my local winebar serves, front in the picture below, is an absolute treat! Does SharePoint mature as well? It depends 🙂 . I know it can be a very useful tool for many many years without upgrade or relaunch, but I have also experienced that a very old SharePoint (VOSP) can start to creak. You will not read much about this topic. Consultant-bloggers usually write and talk about the most recent version of SP. Their role is to know about fresh, clean, empty, virgin SharePoint territory and the glorious things you can do with the latest update. It is you, the company SharePoint administrator, who will take over when the consultants have done their setup, and who will accompany the on-premise SharePoint installation throughout its lifetime. Over the years, you will see some interesting things that the average consultant will never experience. Watch, enjoy and be proud, SharePoint admin, because only you will have the first-hand experience! 1. You run out of storage space in your site collection. You may need to add a site collection. Then you will have to negotiate with your users which content is going to the new location. They will be harassed less often about freeing up space in the new collection, but it will mean rethinking the setup and all their links will change. 2. Lists will start to exceed the recommended boundaries. For some document libraries you will be able to work with content owners to purge, split them up, or put them into folders of the recommended size, but what about Lists? 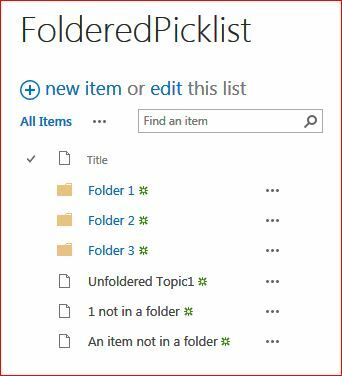 List items can only be in folders if you create every new item in its folder, or move them into folders afterwards by a third-party tool. This is a list with folders, used as a picklist. 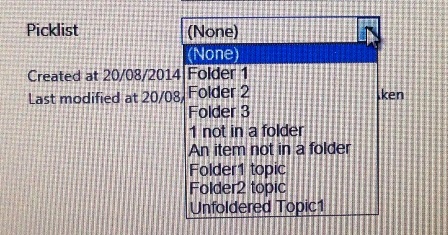 I have some items in folders, and some not, this is clear from the name. And what if this is a picklist? You will see all folders when you pick, as well. This is what you see when you pick a value.You see that folders are displayed first, the other items below. Apologies for the quality – I had to take this with a Phone since I could not make a screenshot. And what if it is a picklist for customers? Do I tell my users to lose some customers because it does not fit with SharePoint 🙂 ? 3. Sites will get abandoned and left alone. People move on, projects are closed, and departments change position or scope. Users are being redirected, and the content is forgotten. These are welcome surprises: if nobody has or claims ownership, you can free up some space. 4. Empty subsites and meeting workspaces have been waiting to be used for years. They tell the sad story of a project or meeting started with ambitions, but never fulfilled. Again, a nice surprise for you, although by deleting you will only reduce complexity, not used storage space. 5. Organizational changes require change of content setup. You may need to rename and reorganize stuff and/or move content to another site collection, that is equally full. On the other hand, you may also find some abandoned sites as in 3 and 4. 6. Updated browsers create compatibility issues. When browsers and other software are updated, compatibility issues with your old SharePoint may pop up. Now tell your users that this is not a SharePoint, but a browser issue, and that they have to go to the PC Helpdesk to get their browser or other software checked out! 7. Strange error messages are starting to appear. Sometimes a profile, a site or a document library gets corrupted for no obvious reason, and no longer works as it has. Workflows suddenly break or run rampant. To solve this, see 9. 8. Third-party tools and web parts are no longer supported . …and the new versions may not be compatible. 9. Consultants are harder to find and they do not know what you have done. As I mentioned consultants are generally focused on the latest version, so it is hard to find someone who likes solving puzzles in older versions. After some years, the people who implemented your SharePoint will have left and no one knows exactly how things were once set up. As a result, sometimes issues will not get fixed. When SharePoint 1 was introduced (before SP2003), websites were static pages maintained by people who knew html. Now, on most websites everyone can like, unlike, comment, and add their own pictures and videos without any code or even training at all. Then tell your SharePoint users that they can not like or comment to news, or that they have to first upload a size-optimized picture to a document or picture library, copy the URL and then add the hyperlink to a box…Good luck! • Keep a close eye on performance, limitations exceeded, used space, workflows and special customizations. Try to solve things before they turn into a problem. • Develop for the long term: keep away from too complicated developments that may need ongoing third-party support, and document any specific solutions you create. • Clean up on a regular basis. A regular spring-cleaning may be a good idea. Will going to the cloud solve all this? Items 1 to 5 will exist regardless of the platform, and may even increase if you never do a big migration to a new version. You may have fewer issues with items 6-10. However, I have heard Office365 users complain about functionality changing monthly. Remember, our users are not SharePoint or software experts – they have a different role and they do not want to relearn their tools every month. But that may be another post, someday. What is your experience with Very Old SharePoint? Have you experienced something that I have missed? Spot on again Ellen! That’s exactly what happens. Hi Ellen, I’ve worked several years in mantaining an Intranet as a consultant and I agree with you on the most part of your assumptions. Thank you, Alessandro. Indeed, the documentation is often in a time and budget squeeze because it is at the end of the project. When creating smaller solutions (like a team site with workflows or something equally complex) I try to create detailed specs that the customer has to agree with before I start. Although it may change, at least we have the requirements to fall back on. But I still prefer to keep things as much standard as possible!